There is a funny thing about growing vegetables. In the mid-Atlantic. A couple months in the summer are really awful: so hot, the weeds grow triple time, special care in watering in and keeps seeds moist to germinate must happen. In general, it is hot and dry. Cooler weather always arrives before we know it. As farmers, every week and month in the growing season flies by, there is so much that must get done every day. It seems unlikely, but even after a really cold night like last night there are still many things growing, and not just inside the hoophouse. 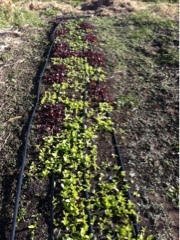 Fundamentally, greens: lettuce, kale, spinach: can survive quite cold temperatures. And weeds don't grow. So growing is easier now than during the "growing season". In this bed, Homer is playing with his food, making a serpent with the seeds, using his Speedy Seeder. And 2 kinds of lettuce. 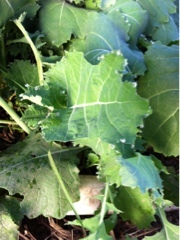 As long as we don't touch the lettuce or kale, shown here with frozen droplets at the end of each tip, and allow it to warm up on its own during the day it is completely edible and usable.